The true story behind the iconic film "Midnight Express." "Have you ever been in a Turkish prison?" Billy Hayes spent 5 years in one for smuggling hash; his ingenious escape was the basis for the movie, Midnight Express. That film became a worldwide cultural and political sensation with its unflinching brutality and terror. It also made the real life Billy Hayes the enemy of Turkey. But that film veered substantially from the truth. Midnight Return: The Story of Billy Hayes and Turkey, the entertaining and insightful new documentary, provides an in-depth look at one of cinema's most talked about films, including interviews with Oliver Stone and Alan Parker who defend their defining work against charges of racism and exploitation, and reveals an ironic twist of fate when Billy Hayes receives an unexpected invitation to return to Turkey from the Turkish National Police. As Billy confronts his own demons, he faces a nation still haunted by the film. 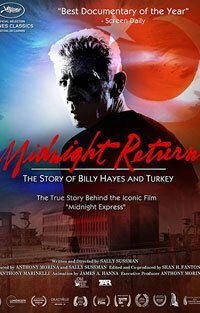 For film buffs, advocates of legal marijuana and anyone who remembers Midnight Express, Midnight Return is a must see film. Cast: Alan Parker, David Pttnam, Giorgio Moroder,etc..
"...a solidly engaging documentary that reveals how the Oscar-winning film Midnight Express has had a remarkably long and unexpected afterlife, and examines how its controversial depiction of the Turkish people affected its makers, an entire nation and the man whose imprisonment inspired the movie."